Country of origin: USA Pandora Vine is a very attractive dense, tight growing semi tropical vine that is native to Malaysia and Australia. 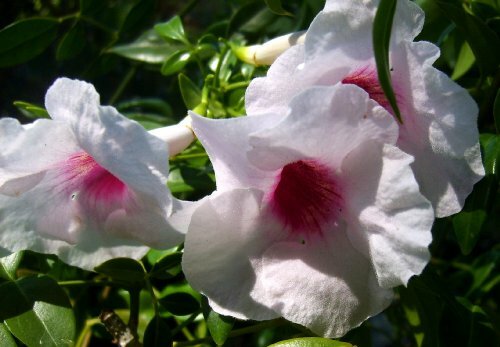 It is also called Bower Vine, Spearwood Bush, and Wonga Wonga Vine. It is a tendriled vine that will scamper up most any upright support, cascade over walls and fences, adding charm and romance to any style garden. Blooms 2 to 3 times each year with lightly fragrant clusters of large pale pink, ruby throated trumpets. The bloom cycle lasts for several weeks. *Well established plants are typically root hardy in Zone 8, but can be lost during periods of atypically cold temperatures or unusually long durations of cold temperatures. If you have any questions about this product by Emerald Goddess Gardens TM, contact us by completing and submitting the form below. If you are looking for a specif part number, please include it with your message.